Everton failed to hold onto a lead twice and eventually fell to a third set piece goal as relegation threatened Millwall capitalised on shockingly weak and ineffective defending – what a complete and utter shambles. The road to Wembley took our mighty Blues into the Lions Den as they travelled south to take on Millwall in the fourth round of the FA Cup, looking for a victory to boost confidence as well as progression to the next round to keep the season meaningful. The two sides went into this tea-time kick-off in contrasting form, Millwall on the fringe of the Championship relegation battle but with four wins in their last six games, while Everton sit mid-table with only three wins and one clean sheet in our last eleven games. His cause for cup progression wasn’t helped though with his squad having a number of injuries and two midfielders, Marshall and Thompson, both cup-tied. The Lions therefore lined up: Archer, Romeo, Hutchinson (c), Cooper, Wallace, O’Brien, Tunnicliffe, Leonard, Williams, Ferguson and Gregory. For Everton boss Marco Silva, only Phil Jagielka was unavailable through injury and if selected, Leighton Baines was looking to play his 40th FA Cup appearance. 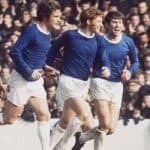 Most Evertonians were keen for the manager to play his strongest possible line-up as with only the FA Cup to go for, any tinkering would be liable for severe scrutiny in the event things were to go pear-shaped. With Evertonians desperate for both a performance and a result, and another fully sold-out visitors section at the New Den, Silva named his starting line-up: Pickford, Digne, Mina, Keane, Coleman (c), Gana Gueye, Gomes, Sigurdsson, Lookman, Richarlison and Calvert-Lewin. Our referee in the evening rain was Michael Oliver. The game had a fairly quiet start until Williams clattered into Gana Gueye and a Coleman cross from the right skidded across the face of goal off the forehead of DCL. Everton were unlucky not to be awarded a penalty as Keane was clearly impeded from a corner. Millwall countered with a long free kick from Ferguson that saw Cooper get a clean header that went well wide – zonal marking at fault again ? Coleman again raiding down the right swung over a cross that was slightly behind Richarlison who drew jeers from the home crowd for his air kick. Another Millwall free kick from the right was hoisted to the back post where Hutchinson climbed to head into the goalmouth, Lucas Digne with a timely header to clear the danger, but two early warning signs for the Blues to take note of and adjust to. The penalty incident apart, the home side had enjoyed the better of the opening fifteen minutes and the Blue needed to settle down and play some football. Richarlison went down under a poor challenge from Romeo who was fortunate not to see yellow while Digne carried on to find DCL whose ball across goal was just too strong for Lookman. Coleman and Lookman combined well down the right with the cut-back cross for DCL hurriedly cleared by Millwall. Yerry Mina needed treatment for a knock on his right ankle on the midway pint of the first half. Richarlison took another tumble as did Coleman as Millwall continued their ‘in your face’ style much to the delight of their fans, endeavour and effort making up for any deficiencies in skill levels. A foul by O’Brien on Richarlison saw Mina go to early trying to get on the end of the free kick from Digne before a good chase by DCL pressured the goalie into a hasty clearance. With rain still pouring, the pitch was beginning to become a factor. Steadily getting wetter especially in the areas looking somewhat thin of grass, a ball from Gana Gueye that sped away from Digne clearly illustrated. A miskick by Archer in the home goal almost presented Sigurdsson with a shooting opportunity, but he couldn’t get the ball under control as the Millwall defence converged on him. Everton made the breakthrough in the 43rd minute as a spell of possession saw Gomes feed the ball into the path of Richarlison who come inside off the left wing, and the Brazilians’ shot took a slight deflection off Hutchison before bouncing perfectly on the wet surface to squirm past Archer. But Millwall struck straight back to level at the break as another long free kick from the home side found Cooper and his header was met by Gregory and his header was well placed back across goal and in under the bar. First half summary – Everton had more possession but did little with it until scoring from our one shot on target, Millwall equalised with their third set piece having given two earlier warnings that were not heeded that they could beat zonal marking !! Kurt Zouma was a half time substitution for Everton replacing Yerry Mina. And Everton started the second half at a much quicker pace, as it needed to be after a largely pedestrian first 45 minutes, moving the ball around quickly to put the home side under early pressure. Millwall were not daunted and, with the rain still lashing down, countered with a good cross from Romeo on their right to the back post where Coleman did enough to smuggle the ball to safety. A decent move saw Gana Gueye find Lookman and his lay off to Sigurdsson saw the shot deflected away for a corner that came to nothing. Millwall scrambled a free kick from Sigurdsson to safety as the Blues tried to maintain some pressure and momentum. A great ball from Richarlison found Digne in space and his instant cross had a bit too much pace on it for Gana Gueye to control and get a shot away. Cenk Tosun replaced DCL in the 65th minute ahead of Millwalls’ Wallace being the first player to be booked a minute later for a foul on Ademola Lookman. Into the final twenty minutes and finally a bit of quality came through as Sigurdsson took a ball from Gueye to feed a fine pass into the path of Tosun who finished well with his first touch of the ball, a low shot across the face of goal and inside the far post. But disaster struck again inside three minutes as Digne gave away a needless free kick by the corner flag that wasn’t cleared AGAIN and the ball pin-balled off the legs of Pickford to Cooper who knew very little about it as it hit his arm and went in. Everton protested vehemently and both Tosun and Gana Gueye picked up yellow cards for their troubles. Theo Walcott joined the fray on 78 minutes at the expense of Ademola Lookman. Gana Gueye was a little fortunate to see a second yellow for a foul on Leonard that saw the Millwall player need treatment to his right ankle. Millwalls’ first change saw Skalak replace O’Brien on 86 minutes, and veteran Steve Morrison made a cameo appearance on 89 minutes replacing Ferguson. Deep into the four added minutes, Everton recorded just their third shot on target as Sigurdsson fired straight at Archer from long range. Irrespective of the controversial and dubious nature of the second equaliser and whether VAR would have worked in Everton’s favour had it been in operation, this was another performance that saw the possession dominated, but possession not put to best use. Everton played without pace and sufficient ideas to break down a resilient and dogged Millwall… and paid the ultimate price for woeful and shocking defending at set pieces throughout the game. If you want a one-word summary – PATHETIC !! !